What if the END OF DAYS could be a manufactured event? What if it was seen not only as positive, but necessary and man could fabricate and control it? What if this greatest of crises could be used to usher in a new path, a new future, our future. The next step in the evolutionary chain of man as viewed by both science and philosophy is the transcendent. Man will shed his limitations either through Mechanics or Ascendance. No longer encumbered by aging, sickness, or death he will break through the prisons of ignorance and the wisdom of a universe he will hold on his fingertips. What if like Teilhard de Chardin, other religious scholars and the governmental leaders that listen to them agreed that the entire human race needed to go through the crucible, a trial by fire to force this as an adaptation? This sounds like a malignant science fiction or fantasy until the documentation is read and understood. 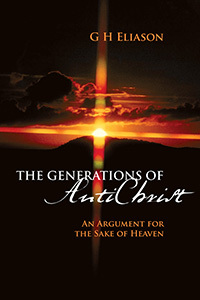 In “The Generations of Antichrist; An Argument for the Sake of Heaven”, in the appendices appropriately titled the same, the history, methodology, seminal works, and theoretical treatise are shown. They are brought up to date by not showing what could happen, but what is happening in real time. The areas of science revolving around longevity are positive they will be able to treat death as a disease by 2025. By 2040 disease and aging will be a thing of the past to those who can afford it. They view eternal life not as possible, or probable, but eventual. The commercially available “iphone” application that syncs with a human brain shows another area higher science is working in. Imagine being able to upload data and then wisdom directly to the mind, a form of Omniscience. Schools would become obsolete, whatever you wanted to know is as simple as purchasing a tutorial program. The internet itself provides a crude form of Omnipresence. The slated release of 3d holographic images for communications in 2015 commercially is proof enough. The work with the Large Hadron Collider breaks down to a methodology geared to understand and eventually employ the work of Creation and in a perspective of defense Omnipotence. This is in real time the work of Mechanical Philosophy. Its stated goal is “The age of Miracles is over we will recreate it.” The qualities of the LIVING GOD have been shown in real-time, and close to real-time. Many of these work both in isolation at their research facilities and communally through foundations such as the Lifeboat Foundation whose main thrust is existential threats. What is very interesting Is the above points don’t even need to be sourced, no reports need to be quoted this information is public and part of everyday life. Since these who are the best and brightest among us share the concerns of pre-millennialism maybe someone should notify Major Stuckert that we have an entirely new group of negative people. Some scenarios given, even for a person like myself who regards the prophesies of the Bible as entirely true, unchanging, and unrelenting are too fantastic to be concerned about. It is easier to tell you to watch the Matrix or Terminator series. Others, not so fantastic and the reasoning behind them is a concern. An ethics paper I read on synthetic biology, specifically self replicating organic nano-tech warned researchers that they had a duty to only speak about the small discoveries, and small potential problems. Otherwise they stood the possibility of being overly monitored and hampered or shut down in areas they wanted to pursue. This tech, still in infancy, acts like a virus and pulls from organic cells material to build other machines. By minimizing the discussion to specific small products and never discussing existential risk they protect scientific freedom and projects are not shut down on that basis. In their words they don’t run the risk of becoming another Max Planck. What is striking and interesting is that most people reading this will view the above as entirely hopeful. If there is a problem, we can prepare for it. If we break it, we can fix it. If we destroy it, we can rebuild it. We can. Post millennial thought revolves around the concept of delivering a perfect world to our King. The philosophy behind the above is also based in this, and it has many forms beyond Christianity. A not so familiar example is the current “Global Warming” movement and science. Former vice-president and Nobel Prize winner Albert Gore received his science from “Club of Rome” research and mandate. As a founding statement the Club of Rome’s true thrust is “To prepare the world for the return of Christ.” This again is Postmillennialist. Mr. Gore’s role was simply as a presenter for a global policy think tank. Philosophically this is post-modernism. It is a form of Neo-Platonics. It is covered exhaustively in my book. Specifically Mr. Gore relies on Mechanical Philosophy and its solutions for answers. Philosophy is inseparable from religion. In a tentative fashion with regard to goals we can tie Mr. Gore to Pat Robertson with regard to outcome, the preparation of a perfected world for the advent of Christ. Mr. Robertson’s view is clearly entrenched in mystical Christian neo-platonic “unity with God”. These two views maintain tension with each other and unity. Both borrow concepts and direction from the other as well as advances. The preparation of a world for the return to Paradise for each is the defined and proactive goal. These two for what remains to be seen by the naked eye are racing toward collision from opposite poles on a map. They are actually driving forces to one particular point on it, the goal or finish line. Although only shown as a brief summation here as for example, within the respective mechanical and mystical sides of philosophy, the issues are defined exhaustively in my book. What would seem improbable even given this example is that Osama bin Laden, within his Qubist philosophy is in full agreement. This is reflected in his own statements. If we in accord with a Living God could take a few steps back we would see multitudes racing toward this coordinate from all points on the map. It takes on the appearance of a wheel with the many spokes running to the center. We are the generation that has lived in a day when all of them approach the Hub, together. Regardless of our view of their good or evil, actually in spite of it, it is their view that drives them. They are neither the groped nor groper. They are the movers of events, opinion, and tech that sift the world into those molds. It is at this point that I pick up with the Scripture. It is its unrelenting nature that man in spite of it, like a moth to light is drawn to devise his own destruction. The Scripture is clear it is the desire of man to look under the skirts of a Living God and see Him exposed and naked, like Ham did to Noah. The goals behind mechanical and mystical philosophy make this goal clear. “Rev 5: 1 AND I saw on the right hand of him who sat on the throne a book, written within and on the back and sealed with seven seals. These seals like the cover on a jar of poison represent the best of our humanity. They are what keep a leader with his finger on the “button” from pressing it to another people’s annihilation. It is the all stop when an argument or conflict arises. The first 4 are justice, judgment, mercy, and love of a fellowman because they are human. The very quality shown when we try to protect or help another and we don’t even know them. As they are opened the conversation changes at all levels from small products and changes with small risks to a conversation about open goals. The risks no longer matter. We will fix it. The stops are no longer there. The reasons to stop an action whether a view of faith, or maybe the personal repercussions are no longer there. The old adage “just because we can doesn’t mean we should is no longer applicable. Just a few examples of our advances toward this, our engineered vegetation can now be grown to detect bombs, make medicine, and lengthen life. Where, when, and how were these experiments done? The scale of the experiment for each discovery would need to be vast. We now have wars with nobody in particular, but we know they will never end. Predators in both government and business openly admit not complicity, but conspiracy to devour the world’s wealth and resources. The average IQ is dropping statistically, infertility is on the rise. One hundred percent of pregnant women are contaminated with chemicals we knew are banned. We are told to hate other people who as people act righteously but not correctly. Our food is becoming the poison that kills our children, and we may no longer be able to afford that. The ground and waters, the earth itself is becoming a poison to us. We will fix it. What is poetic is in reading this there is no horror, but hope. The reason is none of the above even needs to be certified, no reports quoted. It is simple public knowledge for you to look at. The Living God has said “Daily He would have forgiven her, but she would not turn.” His mercy did not fail. The great horror is being Stanley Milgrim’s 65 percent. It is being attentive, and compliant. It is in mimicry of injustice that is acceptable. It is the hate toward another because you are told to, and knowing it. It is knowing in spite of your best effort, your great hope, to those who engage this you mean less than those you devour. In the end when catastrophe strikes you are on your own. You are the hired hand, and now you also are without a job. For you it was written Rev 18: 2 “And he cried with a mighty voice, saying, Babylon the great is fallen and has become a habitation of those possessed with devils and the shelter of every foul spirit and the shelter of every unclean and detestable bird and the shelter of every unclean and loathsome wild beast”. It is that she once possessed a grand estate that blinds her best into pouring themselves out for her restoration. Like the Nazarenes who were told to leave before the destruction of the Great Temple and came back to defend what was good at the request of their congress. They who remember a different day succumb to a blindness that they can return to a goodness that was their glory. It was their allies who destroyed them in that day at the Temple. It will be the same at this day. When she is once fallen she is given over to her desire. When she is twice fallen she is judged for her harlotry. The Scripture is again relentless and unyielding. I had thought to break down the events of the Horsemen or Extinctions but as you can see there is no longer a need. You who are literate read. You who work injustice may still sit and wonder. Ezekiel 14:13 Son of man, if a land shall sin against me by committing a trespass, then will I stretch out my hand upon it, and will break its staff of bread, and will send forth famine upon it, and cut off from it man and beast. Rev 6; 5 And when he had opened the third seal, I heard the third animal say, Come and see. And behold, I saw a black horse; and he who sat on him had a pair of balances in his hand. 6 And I heard a voice in the midst of the four animals say, A measure of wheat for a penny, and three measures of barley for a penny; and see that you do not damage the oil and the wine. Rev 6:3 And when he opened the second seal, I heard the second animal say, Come and see. 4 And there went out another horse, and it was red, and to him who sat on it was given power to take away peace from the earth, that people should kill one another; and there was given to him a great sword. Rev 6:2 And I looked and beheld a white horse, and he who sat on him had a how, and a crown was given to him; and he went forth conquering, and to conquer. Rev 6:8 And I looked and beheld a green horse; and the name of him who sat on him was Death, and Sheol followed after him. And power was given him over the fourth part of the earth, to kill with sword and with famine and with death and with the wild beasts of the earth. Is this really the end of the world?